Meet Turk! He is about 2 years old and the sweetest thing, he LOVES everyone! He is a great snuggler and quickly attached to the 7 year old child in his foster home. He would make a perfect family dog! We have not tested Turk with cats. 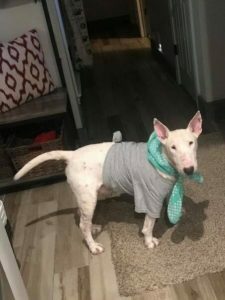 Please visit our website – www.texasbullterrier.org – click on the Rescue tab and complete an online adoption application!